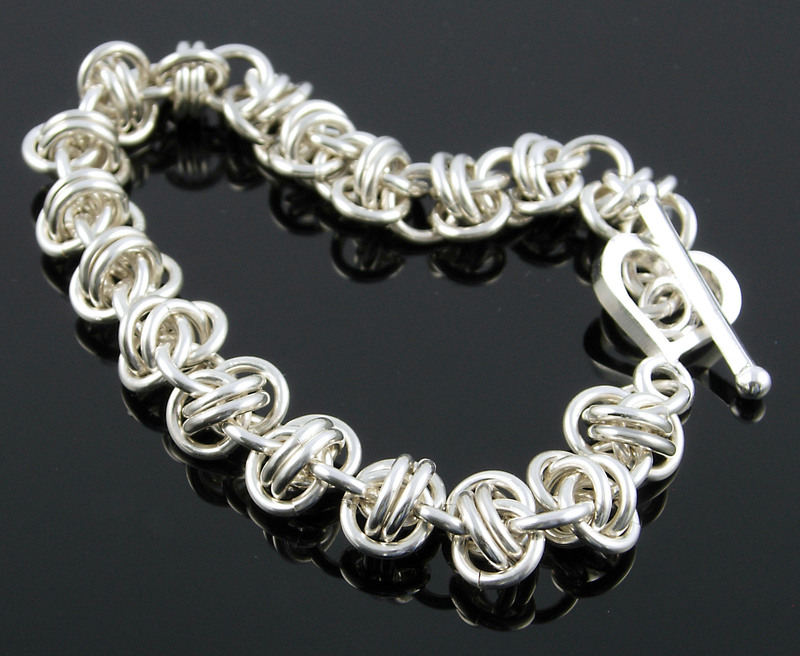 Today we feature a new chain mail pattern from Marilyn. I know you will love this simple yet elegant pattern. Enjoy! This weave is attributed to Susan Richards and appears on the wetcanvas.com forum and the mailleartisans.com website. For this bracelet I used AWG (American Wire Gauge) jump rings, made from round wire. 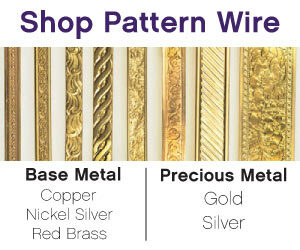 The following ring sizes will work with sterling silver, silver filled, copper, or Jeweller’s Bronze. The bracelet is built with Barrel weave segments. Follow steps 1-6 for one segment. Steps 7-10 add the second segment. End the chain with a 4.5 mm ring. 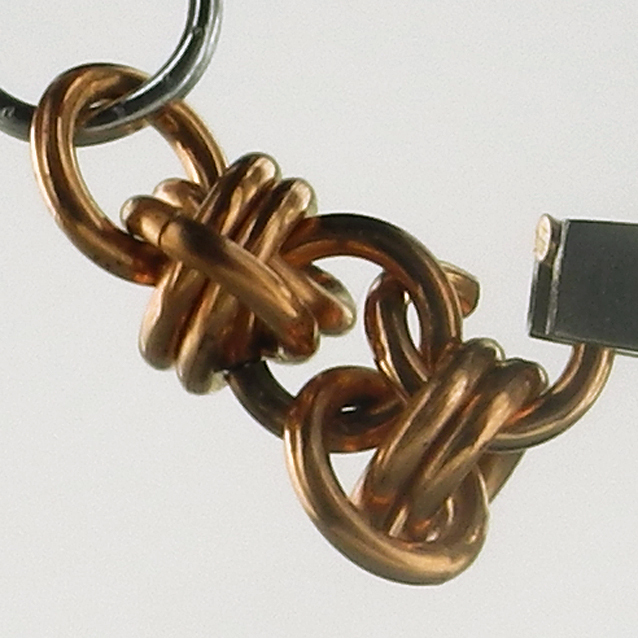 There are 3 segments per inch – plus you have to allow for the length of the clasp you plan to use. 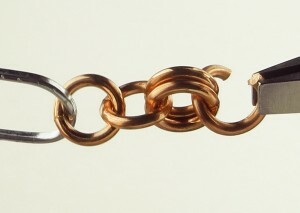 The number of jump rings in the Materials List makes a chain that is 8.5″ in length. 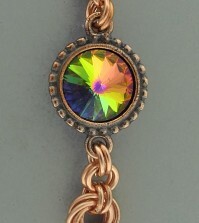 Our goal is to have the ring part of the clasp lay flat when it’s attached to the chain. 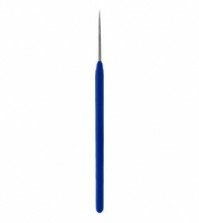 First, notice the orientation of the small ring on ring part of your toggle: is it parallel to the toggle, or does it stick up at a 90 deg. angle? 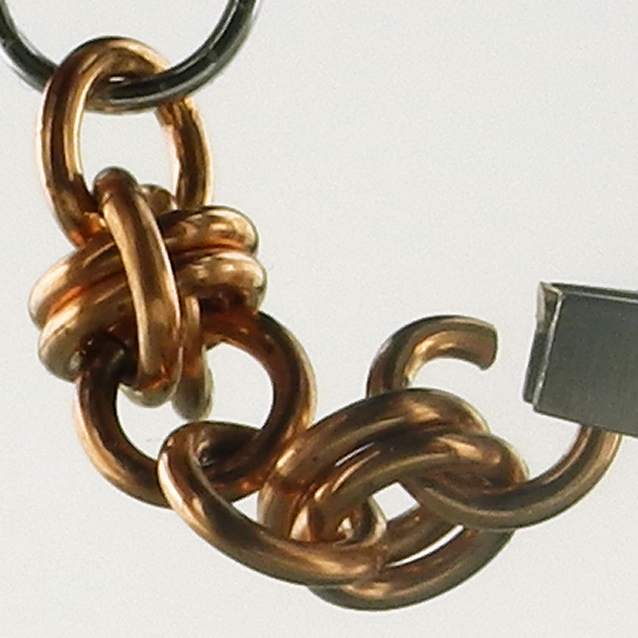 If it’s parallel, you’ll need to use one of the small 3mm jump rings to attach the clasp. 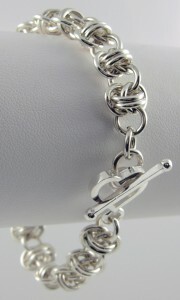 Remove the paper clip or twist tie from the beginning of the chain. 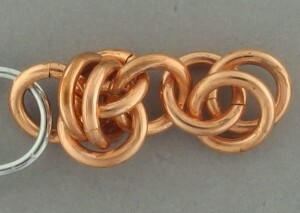 If your clasp had a parallel small ring, open that end ring, add on the small ring of the clasp, and close the end ring. 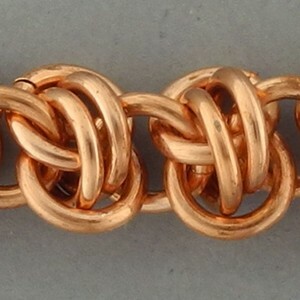 If your clasp has a parallel small ring, open a 3mm small jump ring, add on the small ring of the clasp, and the end jump ring of the chain. Close that ring. At the other end of the bracelet, add three of the 3mm jump rings, linked in a series, to the end ring of the chain. 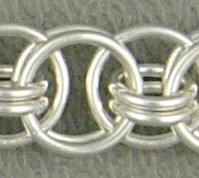 Add the “bar” part of the toggle into the end ring. 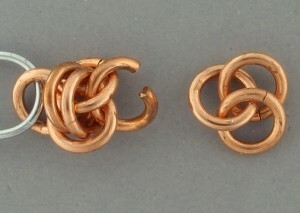 This series of jump rings acts as a shank, allowing the bar to fold sideways and be inserted through the ring part of the toggle. 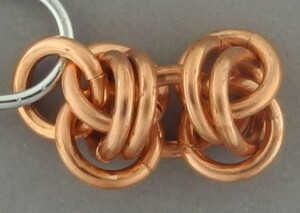 Experiment with other metals and colors of jump rings. 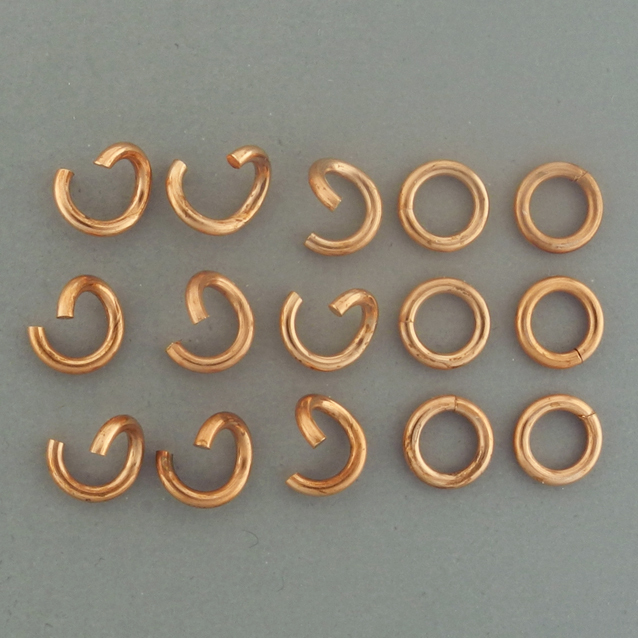 For example, the pairs of rings in the center of each barrel could be different from the other rings. Try it in a necklace length. You could alternated bead links or metal links with sets of 3 or 5 or 7 barrels. 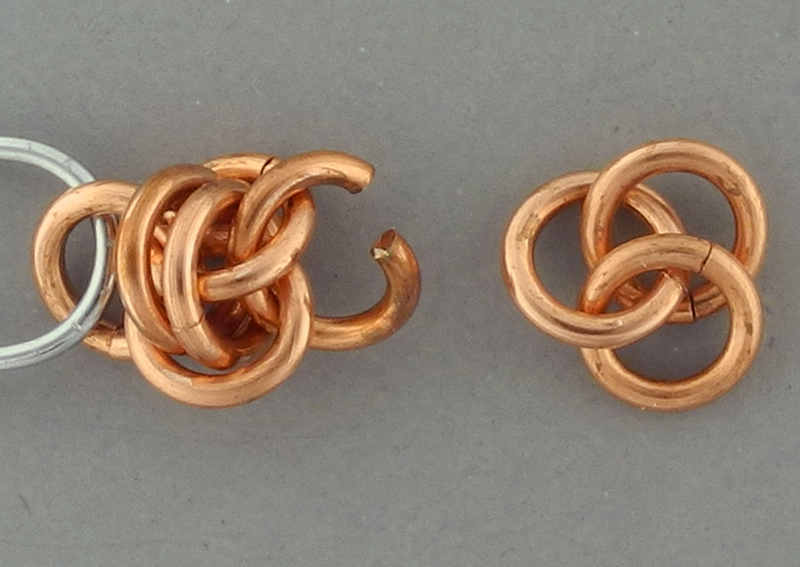 Make 2 or 3 segments for an earring. Use a small ring to add the ear finding. 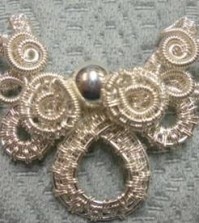 Add a drop bead or crystal. 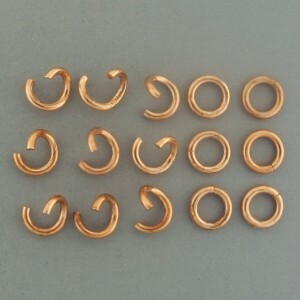 Step 1: Prepare several rows of 5 rings, each with 3 open and 2 closed. 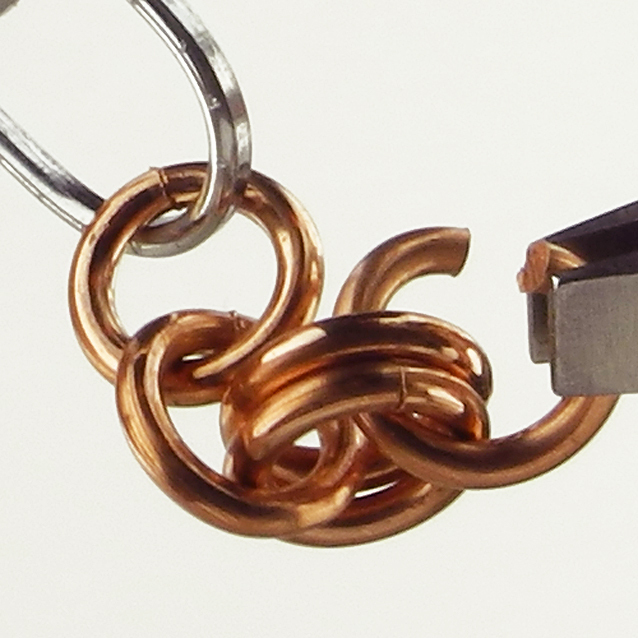 Step 2: Hold one open ring with the pliers, add 2 closed rings, and close the ring (red dot). Repeat to prepare more sets of 3 rings. Each set of 3 will use 2 more rings to connect it to make the barrel chain. Step 3: Pick up another open ring and insert it through the single ring (red dot) of a set of 3 rings and through a large paperclip or twist tie. You now have a short chain of 1 ring – 1 ring – 2 rings attached to a handle. 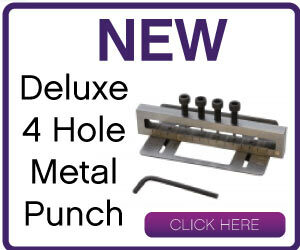 Step 4: Take an open ring, put it through the end pair and hold it there with your pliers. 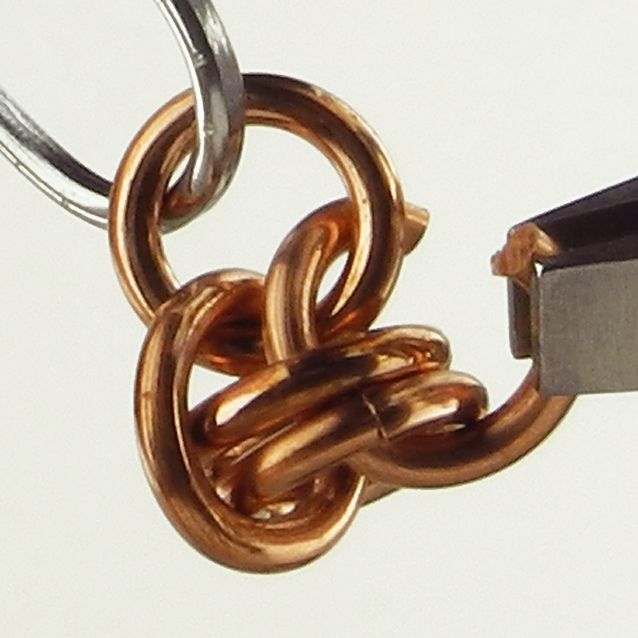 Step 5: Use your other hand to lift the chain upward, with ring #1 tipped away from you (very important). Step 6: Moving from front to back, hook ring #5 through ring #1. 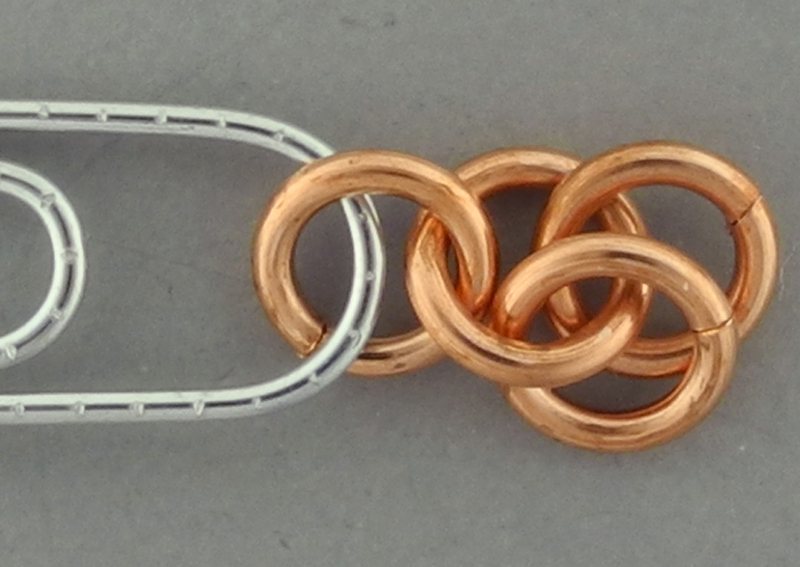 Step 7: Insert an open ring through the sides of the 2 horizontal rings of the previous segment, and then through the single ring of a set of 3 rings. Step 10: …and then front to back through the first ring of the segment (red dot). Step 11: Here are the first two completed segments. Repeat steps 7 to 10 to make additional barrels. 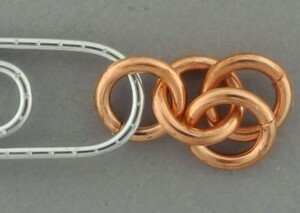 Finish the chain with a single ring through the sides of the last pair of horizontal rings. It will match the very first ring attached to the paperclip. Congratulations! You’ve made your first Barrel Weave Bracelet! I hope you’ve enjoyed this pattern. 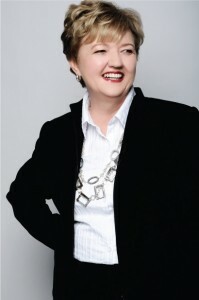 For more of Marilyn’s tips – CLICK HERE!